Some state transportation officials are getting licensed to operate drones as the agency capitalizes on new technology to save money and reduce hazards. 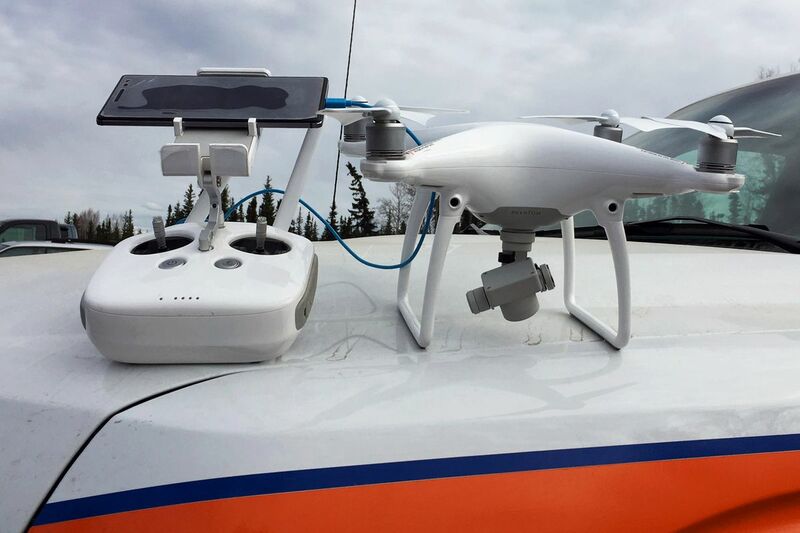 The Alaska Department of Transportation and Public Facilities is also increasingly relying on the unmanned aerial vehicles to supplement information collected on the ground with views from the sky. A handful of employees have already received licenses from the Federal Aviation Administration to operate unmanned aerial vehicles, officials said this week. More employees in the coming weeks will also receive a license and add drone flying to their list of duties. They will help collect aerial images that support projects involving roads, bridges or other structures, officials said. A key step in the agency's efforts to capitalize on the remotely operated aircraft came last summer, when the Federal Aviation Administration finished new rules for drone operations, state officials said. John Binder, DOT deputy commissioner of aviation, said drones could save tens of thousands of dollars on some projects. They can replace costly airborne surveyors that currently fly in chartered planes with a land-based operator using a drone to capture images of terrain, lakes and rivers. Currently, a complete aerial survey at a remote Alaska airport can cost $100,000, he said. With drones, that expense can be reduced to the cost of the machine, perhaps $2,500, and flying the DOT drone operator into the field, said Binder. The benefits could be huge for an agency operating almost 250 airports across the state, Binder said. "Holy cow, there are some great opportunities here," Binder said. For example, a drone can help in the aftermath of an avalanche: Responders can quickly inspect debris strewn across a highway. A drone could help them determine whether motorists were struck, how big the avalanche path was, and how soon the road might be cleared. "Now we work an avalanche from either end, so this would be easier," said Meadow Bailey, a DOT spokeswoman. The agency on Monday announced it is soliciting bids for an estimated $250,000 to $500,000 contract to operate drones and provide photo services over two and a half years. The photo services will involve the creation of 3-D images from a drone's photos, allowing measurements to be taken of features on the ground, officials said. The contract will allow the agency to increase its use of drones as DOT operators gain experience, officials said. Drones can also provide high-quality mapping statewide for use by DOT and other agencies. "We don't have great mapping in the state of Alaska, but drones can fill that need," Bailey said.